From lavish yushengs, hearty feasts and delicious desserts, some options on where to go for reunion dinners with friends and family. 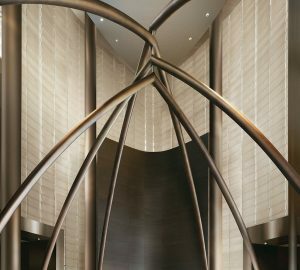 The food at this stylish Cantonese restaurant at the National Gallery has been wowing diners since it opened in 2016. 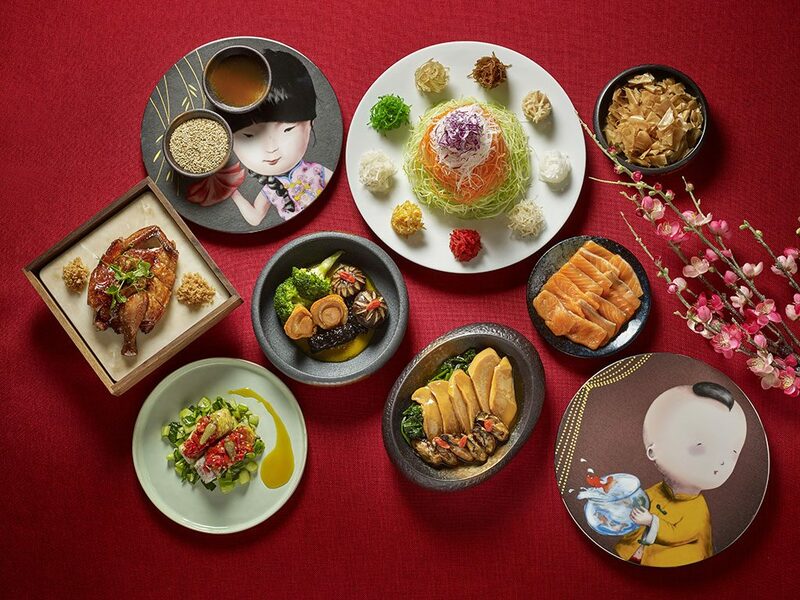 From 18 January to 19 February 2019, the restaurant offers six set menus especially curated by Chef Lai Chai Sum with special dishes chosen to usher in the Year of the Pig. 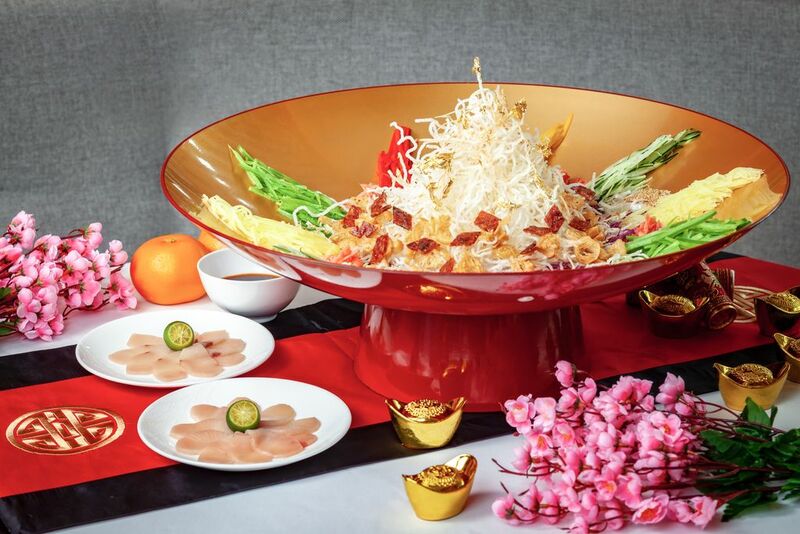 Start your feast with Kaleidoscope of Prosperity, Yàn’s version of the yusheng, an artful masterpiece of crispy fried vermicelli topped with gold leaves (to symbolise a mountain of gold) surrounded by vegetables, sesame seeds, crispy youtiao, and slices of salmon or yellow tail. In honour of this year’s zodiac sign, deep red bakwa (roast pork) is included in this special dish. Pork dishes are the highlight of this year’s set menus. Try the delicious suckling pig done in three ways, which comes in a huge platter. The Signature Roast Crispy Suckling pig is an auspicious red to signify good luck, while the Suckling Pig Carved Shoulder and Oven-Baked Pig Fillet with Lemongrass with their succulent meat represent happiness and prosperity. This year, the chefs have introduced noteworthy pork-centric dishes for your feasts. 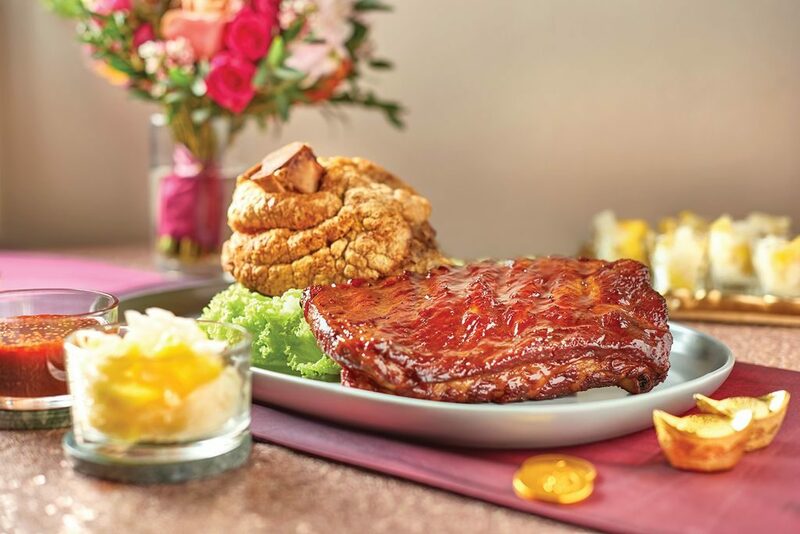 Must-tries include: Prosperity Duo of Deep-fried Pork Knuckle and Slow-baked Honey Butter Ribs. 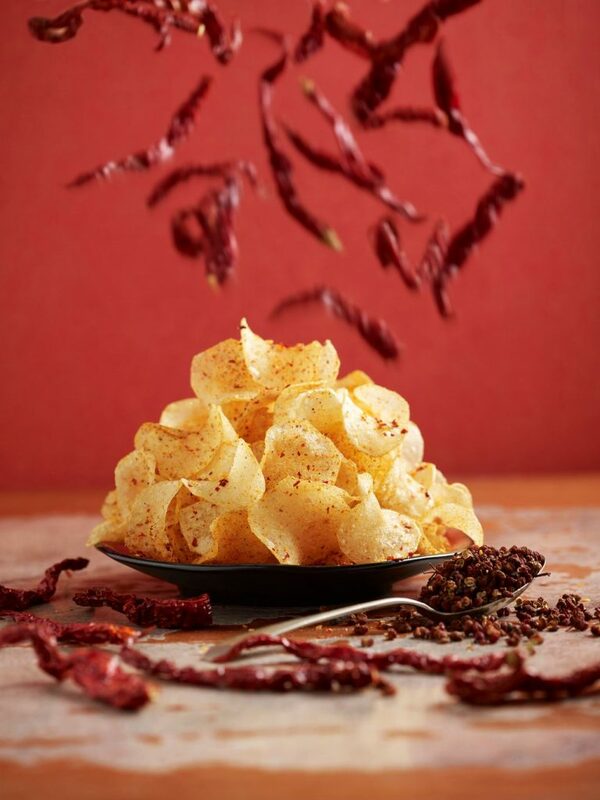 As the name suggests, this mouthwatering dish comes in two ways — the knuckle is marinated in Sichuan peppercorn and salt, then baked for four hours and deep fried to a beautiful golden crisp while the ribs slow-braised for 80 minutes with Kimlan Soy Paste, rock sugar, light and dark soy sauces, garlic and spring onions. Honey butter is then spread over the ribs, which is then slow-based to achieve sweet-savoury perfection. The ribs are accompanied with an oriental chilli sauce while the pork knuckle is served with homemade pickled cabbage. In contrast, the Slow-braised Pig’s Trotter with Abalone and Sea Treasures in Claypot is a satisfying pot of deliciousness in which the trotter is first braised for four hours, after which Australian 10-head abalones, dried scallops, black mushrooms, dried oysters, sliced lotus roots, sea cucumbers and ‘fa cai’ (black moss) are added, before being further steamed for 45 minutes. 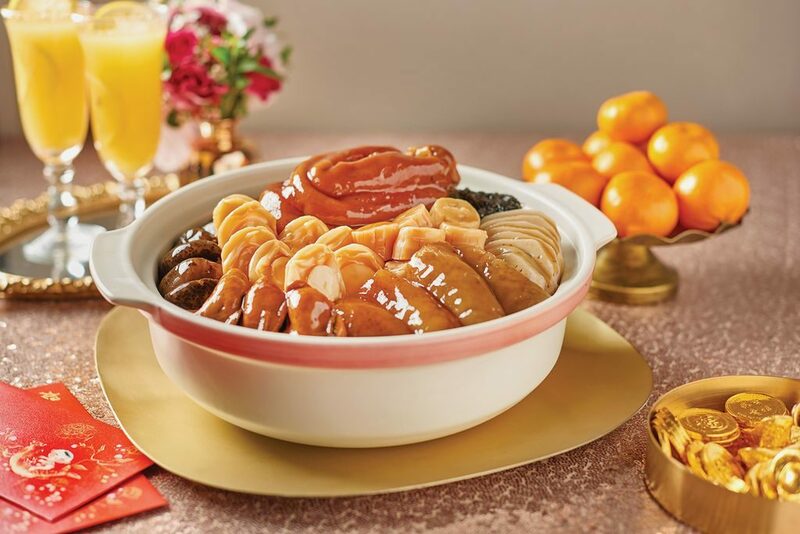 For a heavy dose of nostalgia in a Lunar New Year feast head over to Folklore at Destination Singapore hotel when Chef Damian D’Silva has recreated classics taken from his maternal Peranakan family. 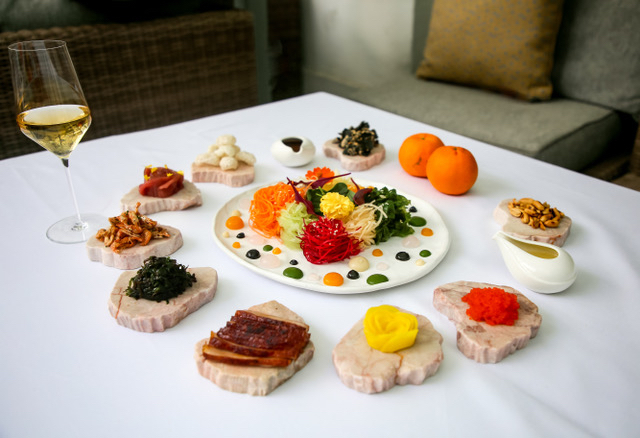 This unusual Lunar New Year feast is heavy on traditional vegetables, which may be unfamiliar to many. For families with young kids, it’s a good way to introduce traditional greens they may not by familiar with, while older generations will have fun remembering classic dishes. 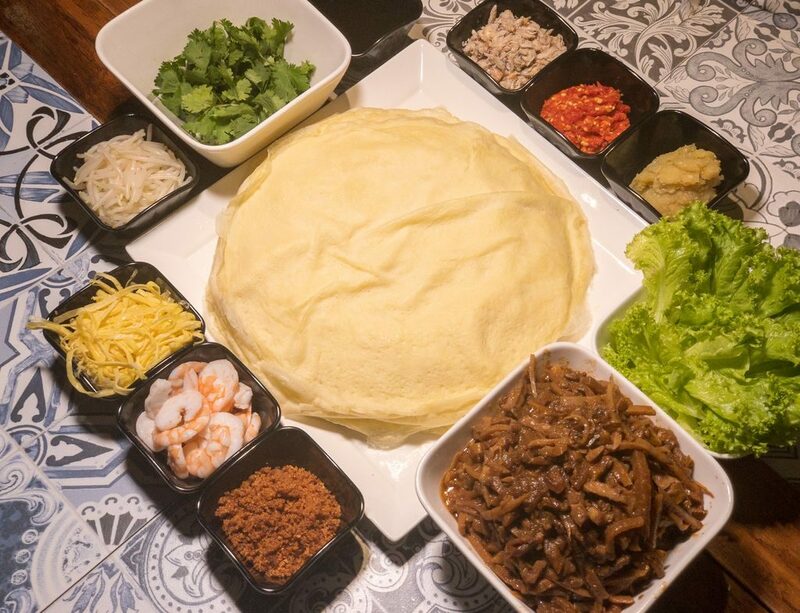 Highlights include the “Do-It-Yourself” Popiah Set, to start off a fun meal. Guaranteed to foster a sense of togetherness as you attempt to roll your own popiah (spring roll), the set is good for four people and comes with generous servings of popiah filling, such as the meticulously hand-shredded turnip, bamboo shoot, pork belly cooked in prawn and pork stock, an array of condiments like the minced and fried garlic, chilli paste, sweet flour sauce, shredded egg, crabmeat and prawn, as well as ten large house-made popiah skins. Other delicious must-trys include the moreish Sayur Kailo with Pork Ribs. Sayur kailo are moringa pods, which are used in Indian and Peranakan cooking. The pods make an interesting counterpoint to the pork ribs, both of which are braised with a rich, coconut-milk based gravy. Best eaten with lots of rice. Another unusual dish is the Garang Assam, which is a take on a dish eaten by Chef D’Silva’s family on the second day of Chinese New Year. 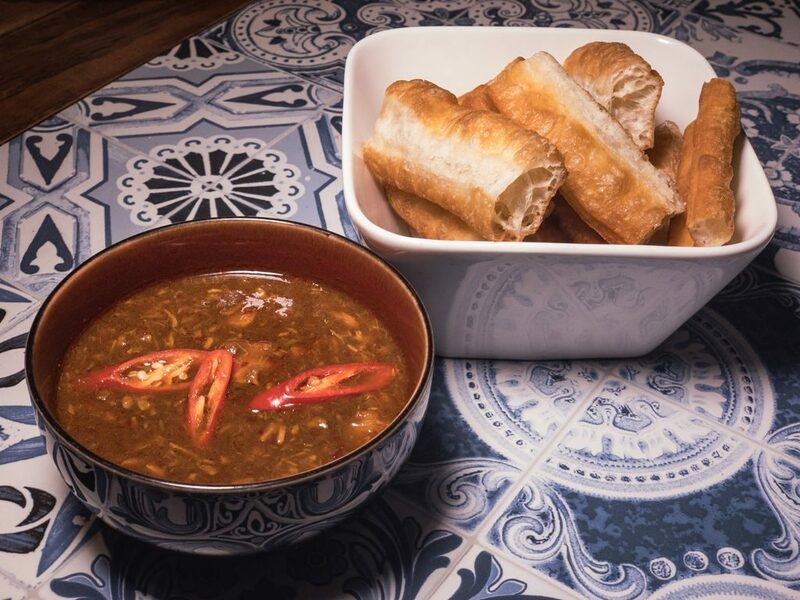 Traditionally, the dish is made with leftover fish that has been cooked down to a thick gravy, which is then eaten with youtiao. Folklore’s version doesn’t use leftovers, of course, but the method is still the same: Red Emperor Snapper fillets are cooked in spices and tamarind pulp to a rich stew that you then have with you tiao or rice, as you fancy. At the Anouska Hempel-designed Yellow Pot at Six Senses Duxton, Chef Sebastian Goh has created four menus (two lunchtime menus, and two dinner menus) that feature special dishes that don’t have additives such as flavour enhancers, lactose, gluten and sugar. Must-trys include Wrapped Chestnut Chicken with Shitake Mushrooms, symbolising prosperity and togetherness. Another significant dish is the Fish Maw and Crabmeat soup and the well-loved Crispy Red Snapper to welcome abundance and prosperity. A feast without toothsome desserts is incomplete, in our opinion. For Chinese New Year, Antoinette has set the bar high with a collection of sweet delights that are guaranteed to put everyone in a good mood. A must-try is the showstopper Abundantly cake, which will literally pours after you take off its sleeve. 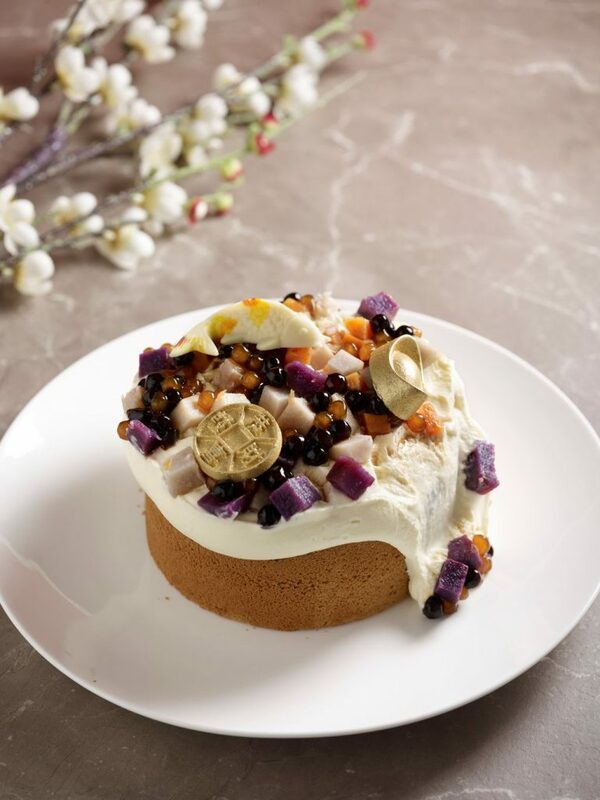 The luscious chiffon cake is infused with rich purple sweet potato and topped with a thin circle of black sesame peanut feuilletine. To eat it, diners slide off a little partition that releases a flowing profusion of salty cheese cream that drapes over the cake and balances a wealth of sweet toppings including black and gold tapioca bubbles steeped in black sugar, lightly candied sweet potato and yam cubes, and gold- covered choco la te coin, ingo t and fish. 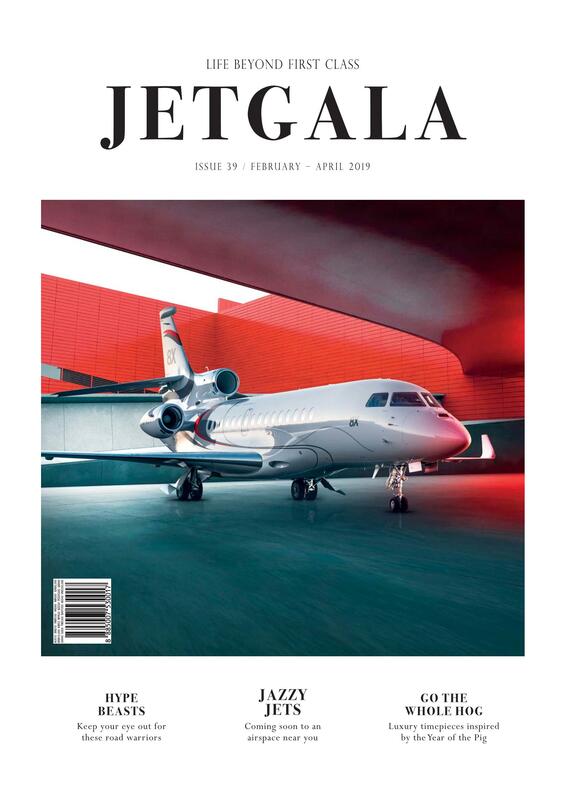 Fun and dramatic, Abundantly is especially ideal for groups who enjoy a hands-on, slightly tongue-in-cheek style of inviting windfalls of wealth and luck into their lives. For a memorable lunchtime feast, head to One-Michelin–starred Alma by Juan Amador. The three-course meal features East-meets-West dishes by Executive Chef Haikal, who marries his training in European cuisine with hearty Asian flavours and ingredients. 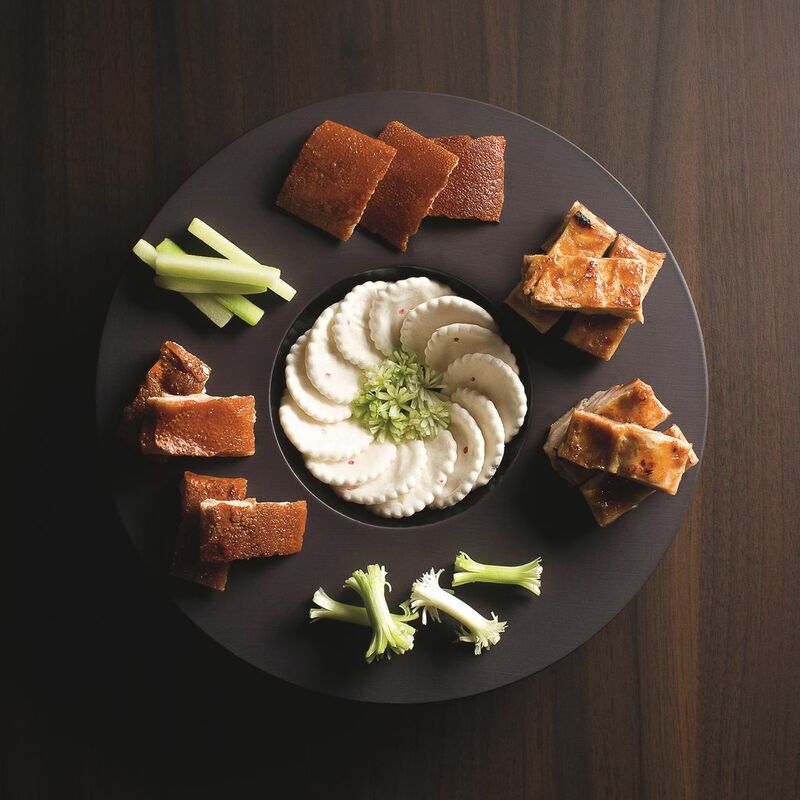 The two choices for appetisers and mains include one Asian-inspired and one Western-inspired dish. while dessert is an interesting Jackfruit granita with a smooth custard and fresh coconut.